Athletes’ careers expose them to countless possible injuries. Additionally, the physical qualifications he or she must maintain are incredibly demanding. Athletes consistently risk injuring themselves and, sadly, even a minor disability can be career-ending for a college or professional athlete. Because the risk is so high, Traditional Insurance companies usually do not underwrite disability insurance plans for athletes. 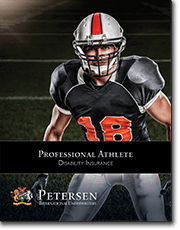 Petersen International Underwriters provides high limit coverage for professional athletes—as well as collegiate stars planning to play professionally—against career ending disabilities or temporary disabilities.